Steve Hochstadt is a writer and a professor of history at Illinois College. The thousands of monuments to the Confederacy and its leaders scattered across the South have become a national political controversy that shows no signs of abating. The decision of the City Council of Charlottesville, Virginia, to remove the statue of Robert E. Lee, mounted on his horse on a 20-foot high pedestal in the center of town, prompted three public rallies of white supremacists in 2017. At the Unite the Right rally in August last year, James Alex Fields Jr. drove his car into a crowd of counterprotesters, killing one woman and injuring dozens of people. He has just been convicted of first-degree murder. The statue still stands. Of the approximately 1700 public memorials to the Confederacy, less than 100 have been removed in the past few years. These visible symbols represent the persistence of a cherished historical myth of American conservatives, the honor of the “Lost Cause” of the Civil War. Developed immediately after the defeat of the South in 1865, the Lost Cause relies on two claims: the War was caused by a conflict over states’ rights, not slavery, and slavery itself was an honorable institution, in which whites and blacks formed contented “families”. Thus the political and military leaders of the Confederacy were engaged in a righteous struggle and deserve to be honored as American heroes. This interpretation of the Civil War was a political tool used by Southern whites to fight against Reconstruction and to disenfranchise and discriminate against African Americans. Northern whites generally accepted this mythology as a means to reunite the nation, since that was more comfortable for them than confronting their own racial codes. During most of the 160 years since the end of the Civil War, the Lost Cause reigned as the official American understanding of our history. The glorification of the Ku Klux Klan in the film “Birth of a Nation” (originally titled “the Clansman”) in 1915 was a landmark in the nationalization of this ideology. The newly formed NAACP protested that the film should be banned, but President Woodrow Wilson brought it into the White House, and the KKK sprang to life again that year in both North and South. Not as overtly supportive of white supremacy as “Birth of a Nation”, “Gone With The Wind” in 1939 reinforced the Lost Cause stereotypes of honorable plantation owners, contented slaves unable to fend for themselves, and devious Northerners. It broke attendance records everywhere, set a record by winning 8 Academy Awards, and is still considered “one of the most beloved movies of all time”. Generations of professional historians, overwhelmingly white, transformed the Lost Cause into official historical truth, especially in the South. Textbooks, like the 1908 History of Virginia by Mary Tucker Magill, white-washed slavery: “Generally speaking, the negroes proved a harmless and affectionate race, easily governed, and happy in their condition.” This idea prevailed half a century later in the textbook Virginia: History, Government, Geography, used in seventh-grade classrooms into the 1970s: “Life among the Negroes of Virginia in slavery times was generally happy. The Negroes went about in a cheerful manner making a living for themselves and for those for whom they worked.” A high school text went into more fanciful detail about the slave: “He enjoyed long holidays, especially at Christmas. He did not work as hard as the average free laborer, since he did not have to worry about losing his job. In fact, the slave enjoyed what we might call collective security. Generally speaking, his food was plentiful, his clothing adequate, his cabin warm, his health protected, his leisure carefree. He did not have to worry about hard times, unemployment, or old age.” The texts were produced in cooperation with the Virginia state government. The Civil Rights struggles of the 1960s not only overturned legal segregation, but they also prompted revision of this discriminatory history. Historians have since thoroughly rejected the tenets of the Lost Cause. All the leaders in the South openly proclaimed that they were fighting to preserve slavery, based on their belief in the inherent inferiority of the black race. Both official and eyewitness sources clearly describe the physical, psychological and social horrors of slavery. But the defenders of the Lost Cause have fought back against good history with tenacious persistence. In the international context of the Cold War, the local journalists and academic historians and forthright eyewitnesses, who investigated and reported on the real race relations in American society, became potential traitors. These “terrorists” of the 1950s cast doubt on the fiction of a morally superior America, as it battled immoral Communism. The dominance of white Americans in every possible field of American life was also threatened by a factual accounting of slavery before, during, and after the Civil War. Bad history persists because those in power can enforce it by harassing its critics. It was easy for the FBI and conservative organizations to pinpoint those academics, journalists, and film directors who dissented from the Lost Cause ideology. They could then be attacked for their associations with organizations that could be linked to other organizations that could be linked to Communists. These crimes of identification were made easier to concoct because of the leading role played by American leftists in the fight against racism during the long 20th century of Jim Crow. Thus did Norman Cazden, an assistant professor of music at the University of Illinois, lose his job in 1953. The FBI had typed an anonymous letter containing what Cazden called “unverified allegations as to my past associations,” and sent it to the University President. Cazden was among 400 high school and university teachers anonymously accused by the FBI between 1951 and 1953. The defenders of the Lost Cause switched parties in my lifetime. Shocked by the white supremacist violence of the Civil Rights years, popular movements and popular sentiment forced both parties to end Jim Crow, using historical and political facts to attack all facets of white supremacist ideology, including the Lost Cause. The shift of Dixiecrat Democrats to loyal Republicans is personified in the party shift of Strom Thurmond, Senator from South Carolina and most prominent voice in favor of segregation, from Democrat to Republican in 1964. It still seemed appropriate in 2002 for the Senate’s Republican leader, Trent Lott, to toast Thurmond on his 100th birthday by saying he was proud to have voted for Thurmond for President in 1948, and “if the rest of the country had followed our lead, we wouldn’t have had all these problems over the years, either.” None of the major news outlets, the “liberal media” reported the remark, dwelling instead on the pathos of the old famous rich racist. Only a groundswell of criticism forced the mainstream media to recognize Lott’s words as a hymn to white supremacy. By then, generations of Americans, both in the South and in the North, had absorbed the bad historical lessons that remain the basis for racist beliefs today. The Lost Cause lives on in the South, supported by federal and state tax dollars. An investigative report published in Smithsonian magazine revealed that the official sites and memorials of the history of the Confederacy still “pay homage to a slave-owning society and serve as blunt assertions of dominance over African Americans.” During the past decade, over $40 million in government funds have been spent to preserve these sites, originally created by Jim Crow governments to justify segregation. Schoolchildren continue to be taught Lost Cause legends. Politics keeps bad history alive, because of the political expediency of the false narratives it tells. American white supremacists have been created and encouraged by this version of American history. So the struggle over history goes on. 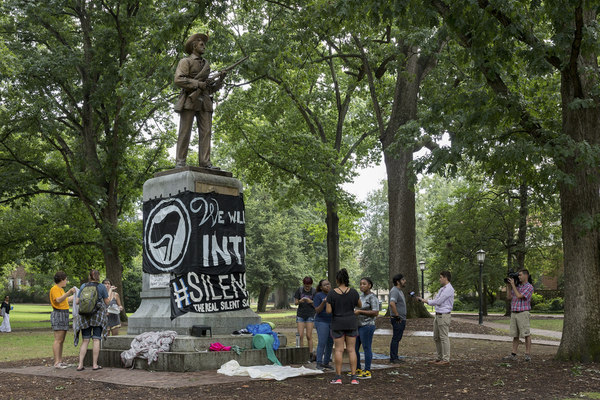 Most recently, several dozen graduate teaching assistants at the University of North Carolina announced a “grade strike” to protest the University’s plan to spend $5 million constructing a new building to house a Confederate monument that protesters had pulled down in August. They are refusing to turn in students’ grades.